BodyComp MF Hexa is the latest addition to the BIA product family of Akern, one of the worldwide leading manufacturers of bio-impedance instruments for clinical and professional use. Over 20 years of experience in body composition analysis, more than 20.000 sold BIA devices, and state of the art technology laid the impressive foundation for all current Akern BIA products. Highest standards in accuracy and reliability, compact design, and an ultra-light weight of only 490 grams are only some of the reasons, why BodyComp MF Hexa is the perfect BIA model for the demanding professional user. Featuring optimal portability and a most comfortable, intuitive user interface BodyComp MF Hexa offers unprecedented ease in body composition analysis. One click will initiate the automatic data transfer via Bluetooth to your PC or tablet under MS Windows®. The test itself will just take a few seconds before results appear in a concise graphical and numerical format on the screen. The unique and innovative BodyComp MF Hexa software perfectly meets the requirements for application in fitness, nutrition counseling, and weight management. 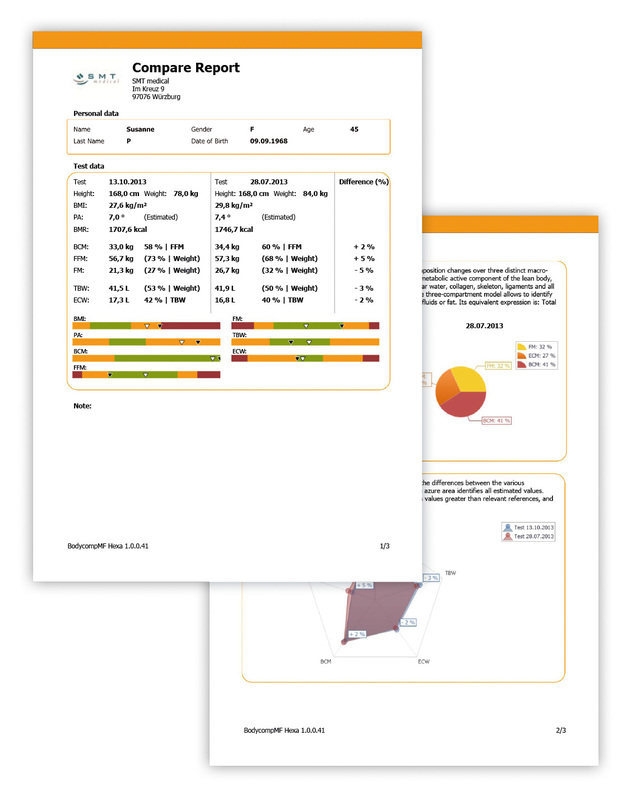 The evaluation shows all relevant information at a glance, clearly presented and understandable. 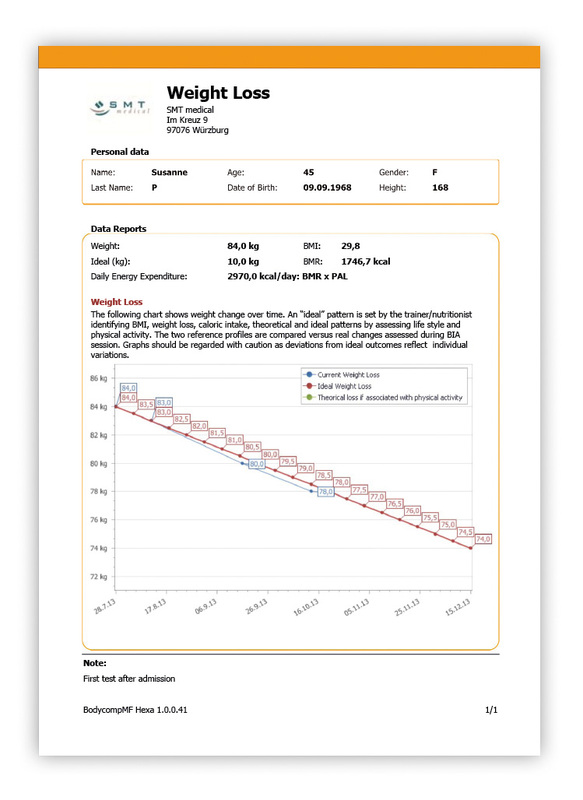 Impressive, easy to understand reports, including graphics, interpretations, and normative data comparisons are optimally suited for your counseling services and as a personalized hand-out to your client. Intended to further improve your counseling service, the BodyComp MF Hexa software contains a training and weight management module. Simply define the desired weight reduction and period and the software will automatically calculate the acceptable daily caloric intake. Selecting or manually entering planned physical activities will reveal at a glance if the prior set goals can be achieved in that period of time or maybe even quicker. This can be a valuable motivation for your clients on the bumpy road to a better body shape, better health or just a better lifestyle. Every client wants to follow advancements and verify improvements. But short term training progress in overweight individuals is often not visible or evident on the weight scale. Showing achieved improvements in body composition well keep frustration at bay and boost motivation. Both, for you and your clients, the BodyComp MF Hexa software will always offer clever solutions. The documentation including comfortable comparison of periodic tests directly indicates a decrease in fat mass, the increase of cell and muscle mass, or the balancing of hydration. This visualization of trends will keep up motivation and offer essential support on the way to personal goals. Verification of body composition is not only vital in overweight individuals, but for everyone interested in his personal constitution. Even for athletes, bio-impedance will yield important information and resultant conclusions about the training. Examination of body composition and state of hydration is essential, especially prior to competition or after injury. Whether checking the state of hydration, the proportion of fat and muscle mass in bodybuilding, or reviewing the overall picture of test data in lifestyle, fitness, and prevention, the variety of applications is sheer endless. BIA tests are quick and easy, yet interpretation of BIA results requires special knowledge and skills that are difficult to obtain. Proper specialized BIA training in a step-by-step cookbook approach is a part of the complete BodyComp MF Hexa package. To let you profit from our long term experience in the medical and professional application of bio-impedance we offer special online seminars, frequently held and conveniently accessible through any fast internet access. The seminar covers all aspects of BIA application in nutrition counseling, professional weight management, fitness, wellness or health management services. With this customized training, in direct exchange with the faculty, you will get the personalized insight into BIA allowing you proper interpretations. Our faculty will also be available for assistance in analyzing test results.